Certain factors may influence the quality and quantity of cervical mucus you produce and could therefore impact not only your chart interpretation but also your fertility. If any of the factors listed below apply to you be sure to record them on your cervical mucus observations chart so that you can recognize trends and identify if a particular observation is unusual or different. In case of any ill health try to try manage your symptoms as naturally as possible. 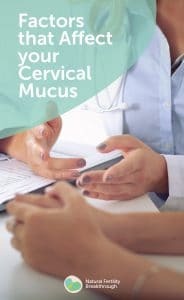 If you notice anything that concerns you about your cervical mucus (for example, if it has an unpleasant odour or it is causing you discomfort, pain or itchiness, or if you are experiencing unexpected bleeding or spotting), seek professional help and advice. Download the cervical mucus observation chart from our free fertility resources section to help you keep track of cervical mucus changes as this is the best way to spot important patterns that can give you lots of clues on how to optimise your chances of getting pregnant fast.